Check out the Guzzi above. Amazing, huh? We found it last week while doing our usual rounds of the web. We’ve done just about everything we can to find out a little more about it, but short of photocopying flyers and sticking them to local telegraph poles we’ve pretty much exhausted all possibilities. Sadly, we’re faced with such hot bike tragedies every week here at Pipeburn; really sweet machines that we’d post on the blog in a second if it weren’t for the fact that we just can’t track down any further info or images on them. So they go into our lost and found folder, never to see the light of day. Until now. If anyone out there knows ANYTHING about these bikes, please feel free to email us and get these rides out of the lost and found and into a post on Pipeburn*. 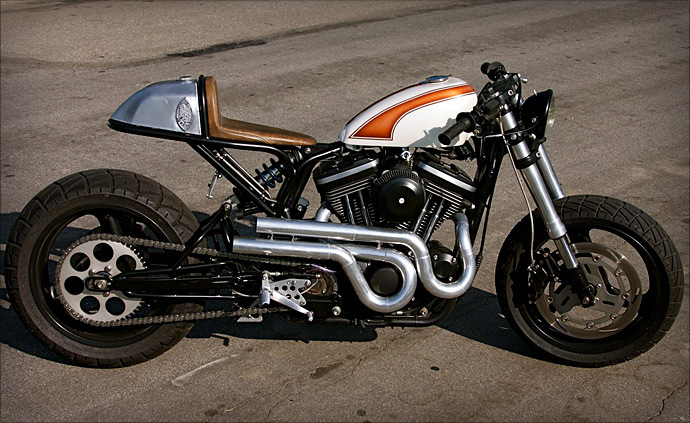 Scott: Then there’s this Sportster cafe racer (above) that has been sitting on my desktop for over a year. I don’t know where I pinched the photo from, but it looks like it’s been built by a pro. 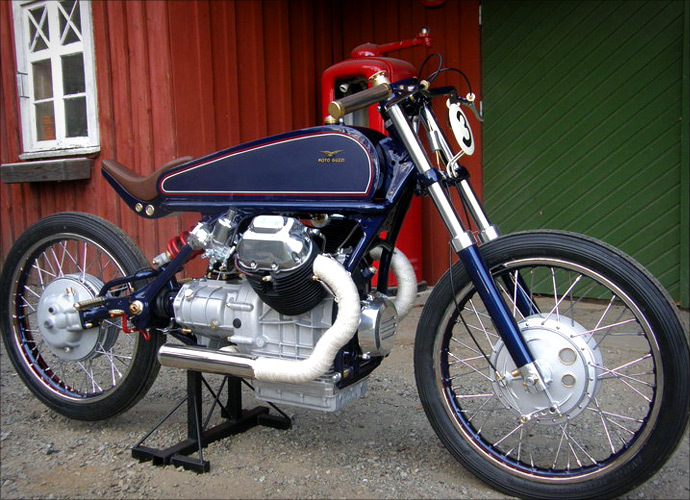 It’s had a monoshock conversion, upside down forks, pipes to die for and the oil tank is in the seat. That logo stamped into the alloy bump might hold the answers. Look familiar? 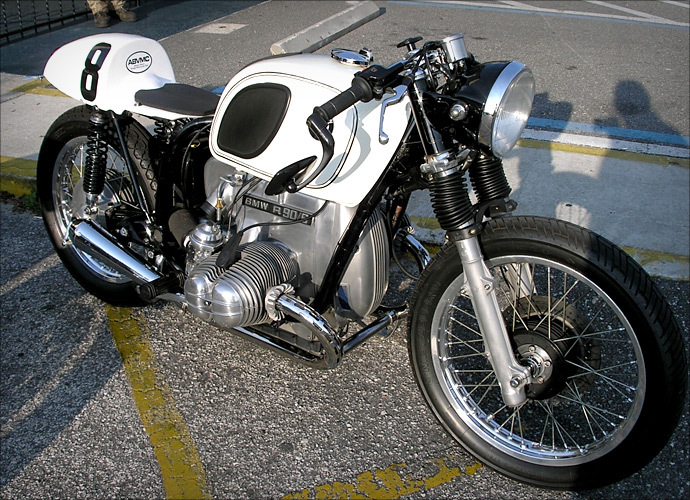 Scott: Lastly but definitely not least, there’s this stunning vintage BMW. 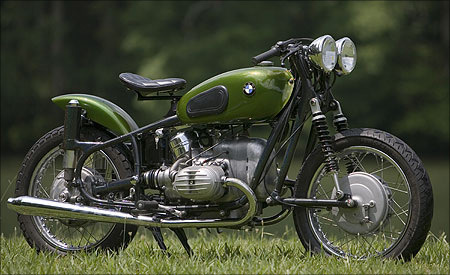 Again, have no idea where the (admittedly tiny) pic came from, but would love to know more about this green German gem. I’m no expert in BM’s but it looks like a 1960’s R60/2, with the unique Earles fork suspension that BMW’s of that era were famous for. Let us know if you have any information about these bikes so we can finally write a proper article on them – which they all truly deserve. If this fails, next step is getting CSI on their asses. *Should any of these bikes actually prove to be much more well known that either of us realised and turn out to be an early Roland Sands design or similar, then we were totally being ironic and we naturally knew full well that the bike had been featured on the front cover of Time magazine on three separate occasions. Of course.